The vision that underlies Mystery & Drolls, as well as the planned activities, are the result of a deep collaboration between the entities that make up this partnership. They all share the vocation towards the popular theatre. They are the protagonists of production, training and promotion projects on an international scale and in this project they are bringing all their history and their daily work to promote a theatre that, through the rediscovery of own origins, intends to recover the dimension of collective ritual, as well as its social value. The conviction with which these five entities are supporting the work program of M&D entails not only an adherence to common values, to a shared aesthetic, or an expectancy to expand their own activity at an European level, but also the sharing of a common identity, which originates from research in the field of theatre and the performing arts, within a relationship between past and present, between popular and cultured, between sacred and profane. In this respect each organization’s involvement in the project is the result of a hard work in research, exchange and comparison, which has highlighted – first at a historical-philological level, and then at the concrete level of cooperation – the need (even more than the desirability) to connect the two International Festivals, Mercantia (IT) and Fools Festival (UK), with the three production and training centers of Teatr A (PL), Maracaibo (ES) and Tempus Fugit (DE). From North to South, from East to West of our continent, M&D has succeeded in bringing together almost 800 years of European theatre history. From this synthesis the projects will aim to extract the best ideas for redefining the role of theatre in the society of the third millennium, its European identity and its relationship with the audience, thereby giving a small but significant contribution to its future history and the value of its activities. Therefore, it is only by defining the identities of the partnership that the project activities can be fully understood in their articulation and impact on contemporary theatre and the performing arts. 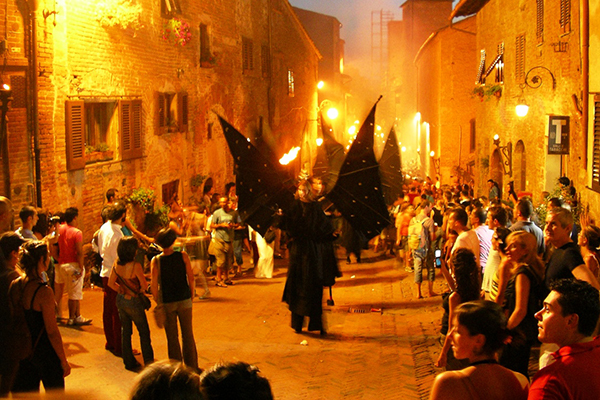 "Mercantia" is the oldest Italian Street Theatre Festival. It was born in 1986 as a Medieval-Theatre-Feast-Market, and it has always shown a preference for the theatrical genre. At that time Italy, the "land of poets and comedians", seemed to have definitively lost the tradition of urban spectacle. In spite of this Mercantia has been able to reassert the value of the "Theatre of the City", and has become the reference model for hundreds of towns and cities that have been inspired by the event over 30 years, bringing audiences back to the public square and renewing forms of drama through contamination with the dimension of the "feast". Today Mercantia counts 45,000 paying visitors in 5 days of programming (the town has just 16,000 inhabitants). It has 250 artists / companies scheduled each year, with various experimental projects and creations, as well as excursions into experimental theatre, dance and circus. All these art sectors express a significant presence at the Festival. Significantly Certaldo, the city that hosts Mercantia, one of the most beautiful medieval boroughs of Europe, is also the home town of Giovanni Boccaccio. In its narrow streets and courtyards we still glimpse the indomitable and transgressive spirit of the great novelist who, at the end of the Middle Ages, transformed the literature of the origins and affirmed the primacy of the tale. From the story to the storyteller, from the drama to the theatre, is but a short step. So if at that time Certaldo was one of the European cultural capitals, immortalized in the Decameron, today, by reinventing street theatre and welcoming every year the best of European productions of this art sector, it returns to its role as "cradle of a new age" for the culture of our continent. The Municipality of Certaldo (project leader of M&D) has directly organized the Mercantia Festival for 30 years, and the presence of this event in the project partnership constitutes a precious opportunity for the European visibility of the programmed actions. The meetings between operators, artists and audience of this important international event will be a unique chance to widen the range of stakeholders, multiply the results and consolidate them in the long period. 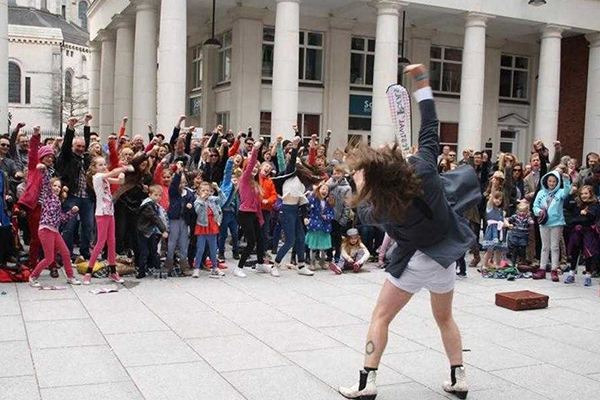 The Festival of Fools in Belfast focuses on the street and the square as performance venues and on the comical arts as poetic and artistic phenomenology. It is a great event that, since 2004, has brought together the most diverse artists from the four corners of the world to the capital of Northern Ireland. 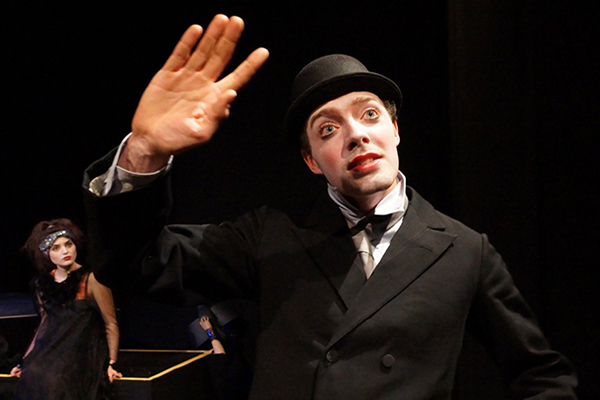 There are more than 120 events that involve the environments of the Circus, Clown, Pantomime and Physical Theatre, Puppet Theatre and Comedy, all having, as a common denominator, the irreducible and caustic humour of the buffoon. The "desecrater", a figure that was so greatly opposed by the clergy of the Middle Ages, as soon as the performance moved from the church to the churchyard and then to the square, was promptly recruited by the clerical Brotherhoods engaged in staging the Mysteries, thus becoming the first professional of farce, engaged to perform parodies of the "bumpkin” (the acts of the "Frammessi") as a means of lifting the spectators from the tragic nature of the show. He thus anticipated the most current feature of modern street theatre: the possibility of a synthesis between the learned environment (of the Church and the Court) and the popular (of the churchyard and the public square), including both drama (Mysteries) and farce (Frammessi). This synthesis took place on the very edge of madness, as recalled by a further name, that of the buffoon (fool). In fact the buffoon was the main protagonist, in England as in France, of the "Night of the Innocents" (or Feast of Fools), a celebration in which all transgression was forgiven and in which even the clerics could transmute themselves into buffoons celebrating any sort of joke and parody. The Fools Festival of Belfast will thus be the second centre for the meeting with the European Audience and with professionals of the Street Performing Arts of the continent, thus hosting and disseminating – like Mercantia Festival in Certaldo – the creation of projects, the results of training activities, as well as the studies and networking activities that M&D intends to develop. The three production centers of Gliwice (PL), Lörrach (DE) and Elche (ES) will also act as centres of research and professional training initiatives, as well as focuses for the creative experimentation of the project. Teatr "A" is Polish independent, professional theatre company dedicated to producing religious musical performances based on originally created scripts. Teatr A seeks to combine the popular language of a musical theatre with the experience of the European theatrical avant-garde. While referring to Polish folk culture it also incorporates originally created texts in biblical passages or extracts from old Polish literature extracts. Being inspired by folk dance choreography and music, it extensively draws upon the heritage of other cultures. In the artistic research of the company, the sacred component is considered a necessary element for drama. While touching upon important issues it strives to establish contact with the audience by means of a most universal language. Taking its cue from drama and music performances, it moves on to explore new forms. By experimenting with elements of street performances, not shunning grotesque and turning to medieval mysteries for inspiration, it inevitably moves in the direction of "total theatre". Throughout the period of Cooperation, Teatr A will host at its own location three professional workshops at a European level and will stage a new production (using creative staff from the cooperating countries) which will then be performed in the festivals of the network. At the other end of the continent is the Maracaibo Company, based in Elche (Alicante), a city which is an indispensable partner for M & D, given that for six centuries it has been the seat of one of the oldest mysteries of history, the only one that, thanks to a Papal Decree, is still today performed inside a cathedral (the Basilica of Santa María de Elche). The Misterio de Elche, inspired by the apocryphal gospels and dedicated to the assumption of the Virgin Mary, is a lyrical drama produced by dozens of actors and singers. It culminates in a festival that involves the whole city (as well as thousands of tourists) and in 2001 was given the status of intangible cultural heritage by UNESCO. 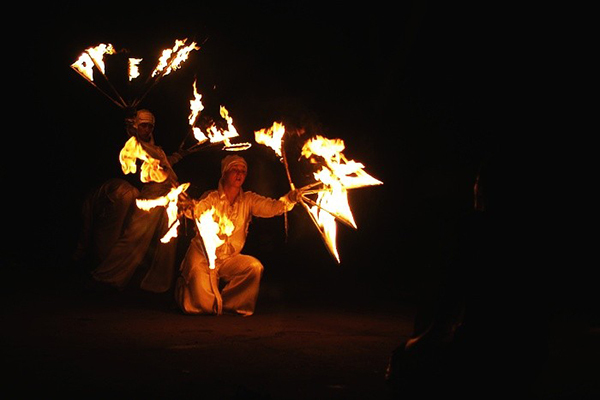 One of the most significant productions of the Maracaibo company is "Mixteri", a street performance that revives in a modern format the forms and languages of the famous religious event. From 1996 onwards the Maracaibo Theatre has produced a series of performances based on medieval subjects-matter and using historical aesthetic materials. 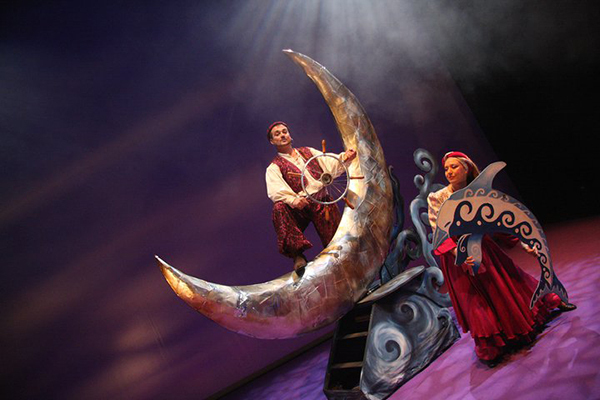 These are productions which play a significant role in the company’s repertoire and are performed in many festivals and medieval events in Spain and around Europe. Even Elche, through the Maracaibo company, will host activities of training, experimentation and production, allowing creative staffs of contemporary popular theatre to absorb the most characteristic elements of ancient drama and draw directly from history, thanks to the exemplary preservation of the artistic and religious heritage displayed by this community. The European Tour of Mystery & Drolls ends with the Theatre Centre of Tempus Fugit of Lörrach in the German region of Baden-Wuerttemberg. The Town (a few kilometers from Basel) hosts a prestigious Carnival which revives forms of the Fastnachtspiele of medieval tradition. It is no coincidence that Lörrach is officially twinned with Chester (UK), an important point of reference for the Mystery Plays that have transmitted to the Carnivals the legacy of Pageants (oxcarts carrying the scenery represented in the "Miracle Play"). Tempus Fugit produces the shows which it presents at its centre and invites other companies to work on theatrical topics. The centre experiments with advanced forms of entertainment linked to dance, work on the mask, story-telling and street theatre. It is a theatre of social and educational orientation, conducted by professional artists engaged in education and expression within the performing arts. Production focuses on experimentation and the study of the choreographic movement, the forms of Popular Theatre, itinerant dramaturgy and sacred performance. M&D will assign various engagements to Tempus Fugit, both in research and in production. This theatre of the Upper Rhine will also act as the partnership’s base for the activities of training and creation, given its organizational capacity (29 employees, 17 employees, 15 interns and 150 actors and teachers) as well as its geographical location, perfectly equidistant from the locations of the other five partners.